A new app called A.R.tist, created by Nova Fleming, allows users to paint the real world in an array of colored lines in AR. Available for free on Apple's iOS App Store, the app functions much like Google's recently released Just A Line, except that it adds color, and (for now) you can't save your drawings, you can only draw in AR and then clear the drawing and start over again. But aside from our mini app review, let's be honest, the best part of the app is its creator, Nova. 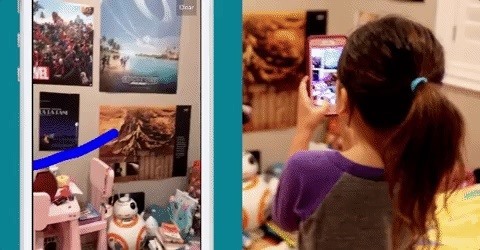 If an eight-year-old buckling down and creating her own ARKit-powered app to compete with the likes of Google doesn't inspire you to aim higher, nothing will. And this isn't even her first app. A couple of years ago, at the age of six, she also managed to cobble together a very basic to-do app after taking Xcode lessons (which she started when was just five years old). We got in touch with Nova's dad, Mark Fleming, to find out more about this pint-sized AR wunderkind. "We've been taking the ARKit Udemy course for about six weeks before she completed this app, taking the various lessons to understand it, but at the pace of one to two hours a week," said Fleming when asked about Nova's inspiration for creating the app. "One lesson in the Udemy course taught the fundamentals of ARKit with a simple drawing tool. She's pretty familiar with Google's Tilt Brush and liked that this was a scaled down AR version. The lesson was only one color option though, and she wanted more colors to play with. I challenged her to figure it out, and that's how she came up applying multiple color options." One lesson in the Udemy course taught the fundamentals of ARKit with a simple drawing tool. She's pretty familiar with Google's Tilt Brush and liked that this was a scaled down AR version. Following the ARKit lessons offered on Udemy (an online learning platform), Nova worked on the app over the course of three weeks, in 30-minute sessions (three hours in all), to complete a working version of the app. "[Her] primary source of guidance were the Udemy lessons, but I was with her most the time," says Fleming, who then pitched in by helping Nova get the app posted to the App Store. Ironically, although Nova's app is on Apple's iOS App Store, her father works for Google on Google Play's Movies & TV content operations team. "She loves the layering of the digital stuff over the real world, and all the cool things you can do with it — virtual pets, dressing up your house," says Fleming regarding what first got Nova interested in AR and VR. "She loves that you can be in completely different worlds and create anything you want. It's hard for her to choose between AR and VR, she loves both. … Also, she loves spending time with dad, doing things that dad is excited about. And dad is into VR and AR." Let this be a lesson to all parents: Spending time with your children doesn't have to mean handing them an iPad while you sit nearby watching TV — there's a better way, and it could lead to the beginning of the world's next tiny tech genius. As for Nova, although she seems to be having a lot of fun creating apps, she's a pretty normal kid when asked what she wants to be when she grows up: veterinarian, actress, and artist top the list so far. But if we're lucky, she'll keep hammering away at code and bring us an immersive experience that only someone born in the AR era could imagine.